Solar Battery: Most viable backup energy source? A backup energy solar battery, which adds to the running cost of the system, is the device that converts the energy of the sun into electricity. These devices make use of the PhotoVoltaic cells to do this conversion. The solar powered batteries are generally implanted in the electronic device and they cannot be removed. The solar cells collect the light and make the electrons in the semiconductors to start moving towards the metal contacts. As the metal contact is reached the energy produced can be stored or also used directly. With the provision of storing the electric power that is generated form sunlight, the solar power cells are extremely useful as storage batteries and are thus very helpful for the users. 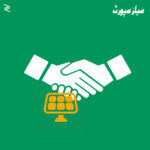 Once the energy is stored, the solar power cells can discharge them as required. 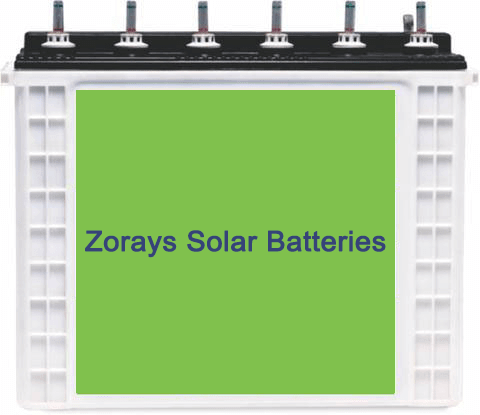 Lead acid and nickel cadmium types of batteries are most commonly used in solar battery cells. The lead acid ones are cheaper as compared to the nickel cadmium batteries. There are certain restrictions with their use as these cannot be fully discharged. The nickel cadmium batteries are expensive but they are more durable in the long run. There are certain technological drawbacks for using solar power in electronic appliances and thus this technology is being used for smaller devices and appliances only. If we overlook the limitations of these power cells, we can actually look to the brighter side of facts that this particular technology can bring to us. There are many practical uses of these power cells even when the limitations still exist. This is the most environments friendly device and as we are targeting to make the world free from pollution by reducing the user of storage battery, the solar power is perhaps the most efficient option to consider. The use of solar power cells will enable us to take the leading steps towards sustainable power supply in the most cost effective way. The storage batteries are still the weakest, most vulnerable component in a PV PhotoVoltaic or Uninterruptible power supply system. The Uninterruptible Power Supply or UPS is the electrical device that provides emergency power when the main power supply system fails. The UPS battery is very much different from the standby generator. You will need to start up the generator while this UPS will start instantly as there is a power cut from the main supply source. The UPS is generally used to protect computers, equipment of telecommunication or data centers as the devices of these systems will not only cease to operate but the power cut will actually damage the whole system and the data will be lost. Pakistan faces daily power outages. Diesel-electric power is expensive, so the battery is discharged daily to about 50% Depth of Discharge (DOD). Besides providing backup during a power cut, the UPS also takes care of the voltage fluctuations and helps to maintain the functioning of the devices with efficiency. Most of the UPS units are equipped with lead acid battery. There are certain factors which are responsible in affecting the life of these power devices. The chemistry of the battery, ambient temperature, cycling and maintenance as well as services is the basic determinants of how the power provider will perform at the time of necessity. The ambient temperature factor is important to realize as any variation from this temperature will result in affecting the performance at the time of need. This can also shorten the expected life of the battery. The capacity of the UPS battery device is dependent on the battery’s capacity to convert the chemical energy into electrical energy at a specific rate and time. There is no such UPS power cell which will last forever, even when it is seldom used. These are electro-chemical devices and their ability to store and/or deliver power decreases over time. It is important to maintain the UPS power cells so that they can perform better and for longer time. Without proper maintenance, the device can face resistance of heat generation at the terminals, improper loading and premature failure. Proper maintenance will ensure the extended life span and result in cost saving for the user. 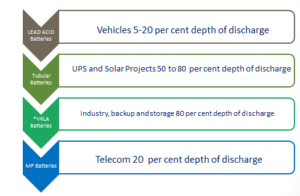 The following figure is broad categorization of different kind of batteries and their usages. Approximately 1.3 billion lead-acid batteries are in use worldwide in 2016 with cranking batteries representing approximately 88% of the total. The total breaks down to 65% Car, 23% Other Starting/Ignition Batteries (motorcycle, etc. ), 8% Deep Cycle Motive (wheelchairs, golf carts, fork lift trucks, etc. ), and 4% Deep Cycle stationary (backup, UPS, standby, etc.). 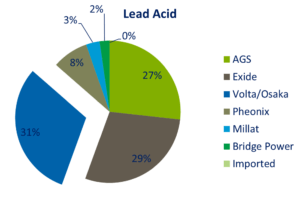 Lead-acid batteries consume 80% of all the lead that produced or recycled. Vented Lead-Acid or Flooded Lead-Acid (Car Battery) for Back-up Energy? Stationary lead-acid batteries remain the economical first choice for standby power batteries with discharge times between 15min and 8h; they have been well proven in practice. The battery can be kept permanently on float in a fully-charged state, as long as both electrodes are in an electrochemical balance. 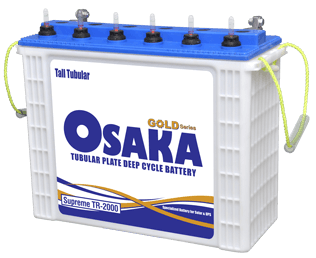 There are few technical points that make Tubular Lead-Acid (OPzS) batteries better as compared to normal flooded Lead-Acid batteries. i. The AGM differs from the standard flooded/wet style in that there’s no free electrolyte sloshing around in the cells. Instead of a paper (or fiberglass) barrier to separate the lead plates in each cell, the AGM uses a Glass-Fiber mat. Think of the mat as a kind of high-tech, stiff sponge that’s constructed of glass fiber and a styrene or acrylic binder, filled with electrolyte and stuffed between the plates. When the battery is initially filled, the electrolyte is absorbed and held in suspension by the mat, the electrolyte staying in contact with the plates through capillary action. Because the mat is very stiff and strong, it provides the plates with more support so they can be made of a softer, purer lead-calcium alloy, which increases the battery’s efficiency. 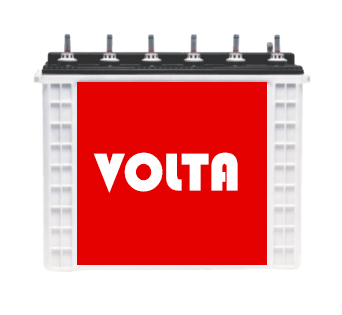 Because there is no pool of electrolyte that needs to be contained, the battery can produce more current for a given size than the equivalent wet cell battery. It also makes them robust and much better able to resist vibration. Since the batteries are sealed, maintenance is reduced; in fact, once the battery is filled and the sealing strip is in place, you couldn’t add water if you wanted to, and by the same token, since there is no vent and no acid to leak out, the battery can be mounted in any position. On that same note, because the plates and separators can be molded into a variety of shapes, AGMs can also be built in a variety of configurations. AGM batteries also hold their charges for extended periods and resist freezing. AGM batteries are non spillable and maintenance free. There is no free flowing electrolyte (acid) in these batteries. There are no removable caps and the cells are non accessible. Absorbed Glass Mat (AGM) is a recent advancement in power sport battery technology. It uses a tear resistant glass mat separator to hold the electrolyte (acid) in place eliminating spills or leaks. Most of our AGM batteries are factory activated meaning they are pre filled and ready to install. 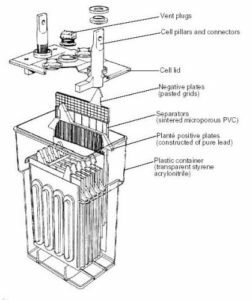 A gel battery is the power cell in which silica dust is added to the electrolyte so that the thick putty like gel is formed. As silica is added to make the gel, these batteries are commonly known as silica batteries. 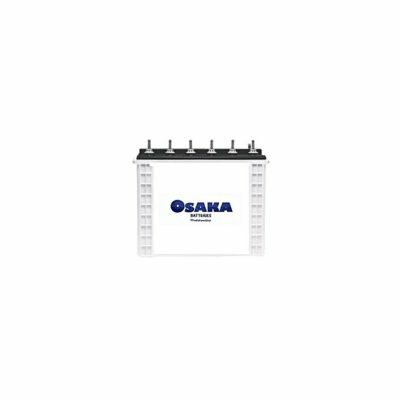 This battery is typically designed as the modification of the standard lead-acid marine or automotive type of battery. The gelling agent (i.e. silica) is added to the electrolyte in order to reduce the movement inside the case of the battery. There are some which use the one way valves instead of open vents that actually allow the normal internal gas to recombine with the water present inside the battery and thus reduce the effect of excess gas. These batteries are less tolerant to high temperatures. These are costly as compared to other forms of power cells. But these negatives are overpowered by the positive aspects of the device. The gel cells have very slow discharge rates along with slightly higher ambient temperatures while operating. As the gel battery system is designed to eliminate the emission of gases automatically, there is no need to worry about the regular maintenance. The gel material prevents any type of leakage and this in turn confirms there will be no rusting at all. No leaking also ensures that you do not have to worry about transporting the thing. You can carry it anywhere with ease. The ruggedly built plastic cases of these batteries ensure that they can withstand vibration, shock as well as heat. These batteries are extremely well built and equipped to be used as a backup battery. As there is no necessity for regular maintenance, you can easily store them for long period of time. They will not get damaged even when not used for long. The only thing that has to be taken care of is to use the proper charger to recharge the cells and once the charging system is properly set up, you can use them as required. Gel cell batteries are very good at holding their charge, and they can be run down to very low voltages and recharged without losing much capacity, but in all other respects their performance trails behind both the wet cell and AGM type of batteries. Due to its relatively high internal resistance, the Gel cell just doesn’t pump out as much power as either the wet cell or the AGM. Gel batteries are highly susceptible to overcharging damage. Thickness of the tubular (cylinderical) plates means more surface area for chemical reaction to take place. The composite materials for tubular plates include fins, lead-alloy spine, positive active material, braided tube. They come in 2V, 6V and 12V capacities are suited for Telecom applications with fast discharges. These use GEL like slurry as electrolyte. Very high DOD to extent, up to 94 per cent. Nano-Carbon offers all the safety and convenience of a VRLA battery with the cycling benefits of advanced energy storage.